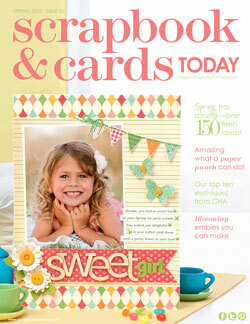 To say that I'm excited that I have a page in the spring issue of Scrapbook & Cards today, is a BIG understatment. I really love this magazine, and even better it's FREE. If you want to check out the new issue - Go HERE. In other news, I'm finally feeling better, and we decided to make our trek down to Utah for a wedding reception tonight. Zoe and I both got new dresses for the occassion/Easter, and someone is SO excited she can hardly wait the 3 more hours until the "party." I left all my craft stuff at home and I'm kinda sad about that. I always seem to get the crafting bug when I come down here.